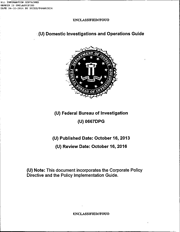 The FBI’s Domestic Investigations and Operations Guide (DIOG) was revised and updated based on comments and feedback received since the original DIOG was issued on December 16, 2008. This new version was approved by Director Mueller on October 15, 2011. The changes primarily clarify and enhance the definitions of terms and procedures used in the original DIOG. Each change has been carefully looked at and considered against the backdrop of the tools our employees need to accomplish their mission, the possible risks associated with the use of those tools, and the controls that are in place. The DIOG was first issued to help implement the new Attorney General’s Guidelines for Domestic FBI Operations that were issued earlier in 2008. Those guidelines had reconciled a number of previously separate guidelines, the first of which had been issued in 1976. The most recent version of the Guide is the version update of 10/16/2013, which was posted here on 9/14/2016.